The three words that my son hates the most are “Time for bed” and this evening was no exception as I began the nightly battle of getting him into bed. He asked me for the one hundredth time to tell him about the first moon landing so I sat down on the bed and prepared to launch into a lengthy dialog about this topic and my treasured memory of it. This memory is, in fact, my very earliest memory other than possibly when I fell out of my mother’s 1968 Buick Wildcat on my head….I’m not sure which event preceded the other but they were both hard to forget. Before I had completed the first couple of sentences, he started the inevitable questions, such as what year it happened-and then he immediately calculated that I was just over three years old and that his mother was still six years down the road and he did it in a matter of seconds. Once he had satisfied this burning need to know these seemingly insignificant milestones in our lives, he settled back into the story about my fascinating life in the good old days of 1969, a time where we had only one television in the house and three channels on the set, a set which had to warm up before the picture would fuzz into view. There are times I just don’t know what to make of his obsession with numbers and his fascination with using them to find answers to his questions. I absolutely DO know where he did not get this talent from and that is from me. I am a letter person who prefers to take letters and form words, joining them together with nouns, verbs, conjunctions and so forth to craft sentences. I am a wordsmith; he is a calculator; I learn from words read in books and on computers; he learns from the sum of all the parts of an equation and those parts may just be simple numbers of dates and times. l grudgingly acknowledge the need for math but beyond that, I have found it to be a very tedious and onerous subject that I would rather not waste any more time on than I have to…..but I admire those that have the disposition and the ability to work with numbers and my admiration extends to him as well. I know where a lot of it came from though. Math runs in my family and if it runs in my family like a creek, it runs in my wife’s family like a river. My mother and my father were both excellent in math, as was my brother. My wife majored in accounting in college and her father is a college professor that teaches accounting. She will tell me that accounting is not math in the pure sense of the word but it is still work that involves numbers and the thought of it makes my head hurt. Wherever that creek was running, there was obviously a severe drought in 1966 because that creek bypassed me completely and found its way to my brother before moving on to the next generation. The only math I was ever good at was geometry and I’m sure that was only because of my love of architecture and drawing. Below is a good example of my grasp of geometry and its principles (kidding). 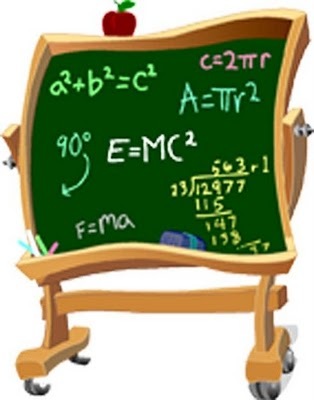 My teachers, most of whom are still around, no doubt remember my lack of effort to master the art of mathematics and it wasn’t until high school that I finally found a math teacher of superior teaching ability that was able to tap into that part of my brain and clear the cobwebs out. She got me through high school math and almost all of my college math as well and I’m not above calling her on the phone today if I run into a budgetary calculation that I can’t remember the trick for arriving at the correct answer. My son, on the other hand, suffered the first of one of life’s little disappointments recently when he got his report card from school and learned that despite his best efforts, he had not been able to pull his average math score for the entire school year any higher than the 98.7 he came home with. I told him not to worry about it, that he still might be able to go to Harvard someday but he better really buckle down in the second grade. He didn’t find that funny at all. It occurred to me this evening as this discussion of manned space flight turned into an exercise of how old his father was at given points in history that he has inherited something from me though that I had never thought about before-his want to understand and be a part of the flow of time itself, not just the current time but past and future time as well. When I think back, I realize how often he does ask questions about time. He seems to always want to know how old I was anytime that I recall something in my life to him but rather than ask me “How old were you when you …..” he would rather know the year and then calculate it himself. He will then figure out the relative age of his mother, my mother and, if it occurred within his short span of life so far, how old he was at the time. It’s almost like he has to know the universal constant that is time and where HE fits into it at any given point, even if it is a point that precedes his own life. I’ve seen this come out when he’s gone to the cemetery with me to check on the family-while I’m relating the history of someone who has departed, he will study the dates on the marker and subtract the first year from the second one to come up with a number of years lived. If I tell him a car I see is a certain year model, he will tell me how old it is in years and how much older than him it is. He also likes to look ahead too and will often remind me that when he is 60, I will be 98. Maybe I’ll be lucky enough to live that long! Someone told me once that if you were lucky, you married someone you loved and that the two of you would produce children that would combine the best attributes of both of you. In my son, I see a lot of talents that I don’t have and I am fairly sure they come from his mother’s side of the family and his love of numbers is one of those talents. From me, he inherited a fascination with and an attention to time and the measurement of it. He hates to be late, just like I do and he times his life down to the mere minutes at times, measuring out how much time he has left to play and balancing that with how long it will take him to bathe and how much TV time he will have left before bedtime. Maybe it’s not a love of math he has after all but that he just uses it well as a tool to help him understand his adversary, Father Time. I say adversary because in this essay I have never mentioned that he loves time-just that he seeks to understand it and as he masters it, to learn how to make the most of it. He knows it is finite and predictable; that the length of each minute is measured in the full revolution of the second-hand and that each turn of that hand marks less and less time he has to play, to run, to watch TV or to just do what he wants to do. At the lofty age of seven, he has already become subconsciously aware that time is not on his side, that he will only be given so much of it and that he must live every moment as fully as possible. What a shame that it takes some of us our entire life to realize what he has already figured out. 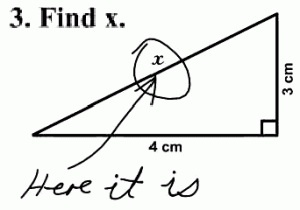 I have to say that your answer to “find x” is the one I would be most likely to come up with first, myself. Nice story! I found “X” too! It wasn’t easy….